Toronto – The day before the government will table its 2018 Budget, OPSEU President Warren (Smokey) Thomas came to Queen’s Park to hammer home the critical need to make urgent and substantial investments in the province’s crumbling correctional system. Click on the image below to view a video of the news conference. “Unless this government invests heavily in fixing the crisis in corrections, no one in Ontario should feel safe: not staff, not inmates, not families in communities across this province,” said Thomas. The OPSEU President addressed the media on the state of corrections in light of Bill 6, the Correctional Services Transformation Act, and in anticipation of the provincial budget. Joining him was Chris Jackel, chair of the Correctional bargaining team. The Correctional bargaining unit is now a standalone bargaining unit within the Ontario Public Service Employees Union (OPSEU). As such, the team is negotiating a first standalone collective agreement with the government. “This government claims it’s fixing the crisis in corrections,” said Jackel. “In reality, they’re doing a lot of talking and little else. As frontline workers in the institutions and probation and parole offices, we see the gaping holes – both literally and figuratively. Thomas noted the recent Speech from the Throne did not mention corrections. “This is when the government sets out its priorities. So when there’s nothing about fixing corrections, you get a pretty good idea of how important it is for them. 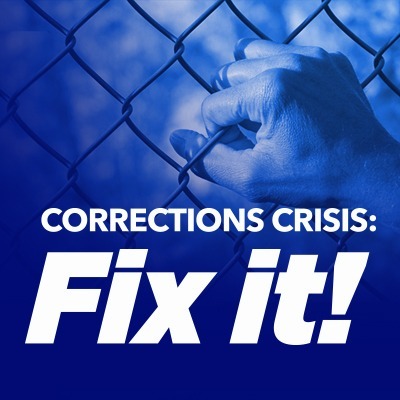 “But I want to tell this government: Fixing corrections is vitally important. It’s important for correctional workers, for inmates and for communities. Because lives are at stake – their lives.